AERO3D is a spherical panorama (360 ° x180 °) obtained with photo stitching. The result is a fully interactive multimedia product, the user can explore it in all directions with the ability to perform very driven zoom on details of interest, all is made available both for the web and for portable devices (tablets, smartphones) . Interactivity is completed with the inclusion of selected hot-spots that may open information windows, external links, movies, etc. 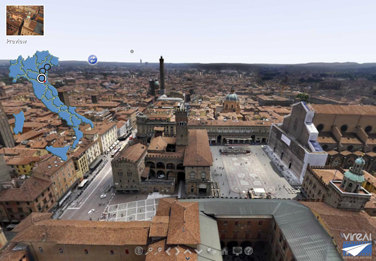 Multiple 3D Panoramas can be linked to each other and dynamically highlighted on a synoptic chart allowing real exploratory tour of territories or commercial buildings. The fields of application of these products are numerous, from the promotion of tourism and local advertising for businesses, to the representation of sports facilities (golf clubs, racetracks, sports centers) and archeology.